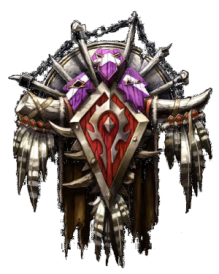 The Horde is one of the two major powers in Azeroth, opposing the Alliance, and contains 5 of the available player races: Orc, Troll, Tauren, Forsaken, and Blood Elf. The seat of Orcish power is the capital of Orgrimmar in Kalimdor. Durotar as well as the nearby areas of The Barrens, Stonetalon Mountains and Thousand Needles, are all Orc controlled or have very strong orcish presence. Technically only Durotar and the Barrens are considered Horde territory for the purposes of PvP servers. To the north of the Barrens, the orc are currently in a stand-off with the Night Elves for their lumber. The orcs are still very much a warlike race, raiding the other races for food and resources, their lands are contested by Quillboars, Centaurs and other humanoids. The Trolls have no real land, and call the Orcish city of Orgrimmar their capital. Trolls can be found pretty much everywhere there are orcs. While they attempted to build a new place for themselves in the Echo Islands, betrayal of one of their witch doctor prevented this from being successful. Following their victory against their hated enemies, the Centaur, the Tauren claimed the grassy plains of Mulgore has their home. There, they constructed the city of Thunder Bluff, which was their first city and made into their capital. Made mostly of the former inhabitants of Lordaeron, it seems fitting that they would remain there even in death. The forsaken have solid control over Tirisfal Glades and Silverpine Forest. They are in contention with the Human Lands to the south in Hillsbrad Foothills and to the west with the Scourge in the Plaguelands. Silvermoon City is the capital of the Blood Elves, a fractured remnant of their once powerful empire before the scourge laid waste to it. They have capture a Naa'ru, which is kept bound in the lower levels of the city and used to fuel the power of their Blood Knights. The Blood Elves are surrounded by the undead Scourge, which they must fight in the Ghostlands. This page last modified 2009-02-15 20:39:13.